Rhytidectomies, including facelifts and brow lifts, can cause hair loss, especially in the hairline in the temple area. Temporary hair loss is common, but the condition can be permanent. Facelifts involve pulling the skin, cutting excess skin, and resewing it back. The skin is undermined and manipulated during a facelift. This manipulation can traumatize the hair follicles in the area where the procedure was done. Most of the time, the hair grows back. Sometimes, the hair follicles are so traumatized that they do not grow back. In these cases, hair transplants are usually a viable option. A woman came to Dr. Shapiro’s Hair Institute after a brow lift damaged her hairline. Using follicular unit transplantation, the doctor was able to repair and restore her hairline with completely natural-looking results. A strip of her scalp was removed, and the area was sewn up. The hair follicles were isolated and carefully processed for transplantation in the bald patch. After the procedure, her hair grew back beautifully, giving her the results she wanted. Another female came to Dr. Shapiro after a facelift damaged her hairline, as well as the area above the ears. Distraught that her rhytidectomy had resulted in hair loss, she sought a hair transplant. The results were virtually undetectable from her original hair line. The hair transplant used her own natural hair from another part of her scalp. She was very pleased with the results of her hair transplant. Not every dermatologist can achieve these kinds of natural-looking results. Seek a hair transplant doctor who has several decades of experience, and focuses only on hair transplants. With this kind of procedure, performing only one or two hair transplants per week will not allow the doctor to develop the skill level needed for incredible results. 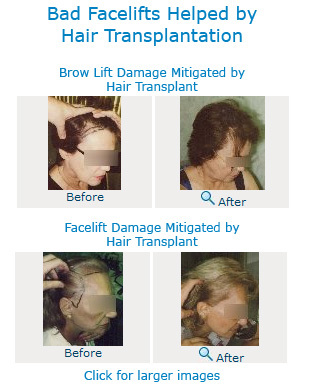 Dr. Shapiro, with hair transplant clinics in Boca Raton and Miami, Florida, has over 20 years of experience in hair transplant surgery and can help many women who experience permanent hair loss after facelifts and brow lifts. 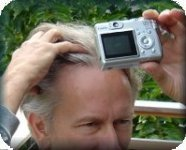 This entry was posted in Baldness, Hair Damage, Hair Loss, Hair Loss in Women, Hair Problems, Hair Transplant, Hair Transplants on November 3, 2009 by Larry Shapiro.